So 2017 is nearly finished and what a trip it has been. There has been so much bad in the last few months that I very nearly lost it ... and I mean that in one of the worst ways possible. But certain events shook me to the core of my being and showed me what path I was on, and what the possibilities could be if I only accepted myself and all my flaws, and worked towards the greater good of the horde. There has been much planning over the last few weeks that no one but theWE know about, and starting a few days ago the new plan has been put in to action. Still a lot of steps to get to the current goal but the target is in sight. So HOORAY with getting unslumped and working in a completely new direction while I patch up the errors of the past, and try to rebuild some burned bridges along the way. As a minor celebration of the, for lack of better term, awakening ... I am giving away my last actual zombie cat painting of 2017 ... the only catch is you also have to adopt a zombie cat. 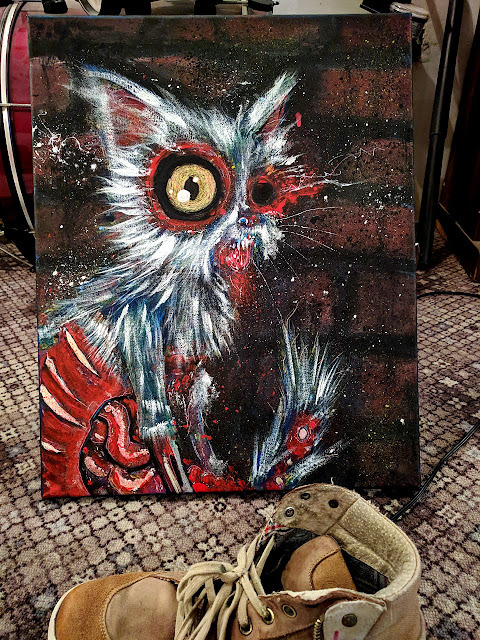 There are 50 zombie cat paintings available, each about 4"x6" and one of them has a golden ticket that gives the owner the big zombie cat painting you see above. The bonus though ... each cat is available for just $20 instead of my regular price of $75. It's a way to get the last zombie cats out to new homes that will appreciate them, instead of sitting in a storage bin, and it's super affordable. Quite possibly the last time I'll sell an original that low. You can adopt one by clicking here but if that gives you issues please let me know and we can arrange a paypal transfer or something. 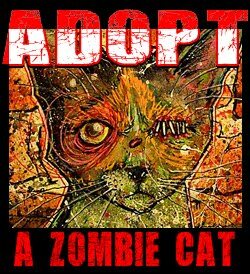 Your support will also go a long way to helping grow the horde so seriously consider adoption before the new year :) For those that can not have a zombie cat in their life, please feel free to consider yourself helping by simply sharing this post. Thanks for reading, have a freaking awesome end of the year celebration!